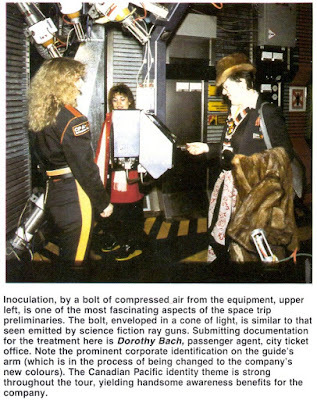 Tour of the Universe, officially opened for business in late January taking upwards of 300 people per hour on flights to the environs of Jupiter. CP Air is a sponsor of the project, and should benefit enormously from the wide publicity that will be generated. The space trip is a world class attraction that took almost 4 years and $12 million to develop. Reduced to simple basics, it's a 15 minute "flight" in a B747 simulator, with the whole show extended to about an hour when pre-board activities are included. The realism is exhilarating. 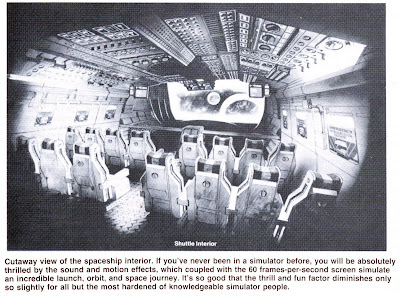 The simulator, with its 10 video and seven audio systems, pulls off the illusion of a functioning spaceport in the year 2019 with regular flights to Jupiter. Flights to other spots in the universe are under development. If you're wondering how a rocket blasts off from the heart of Toronto in a conventional ball of flame, well it doesn't. Remember, it's the year 2019. Blast off is accomplished by linear magnetic traction, up the hollow core of the CN Tower. 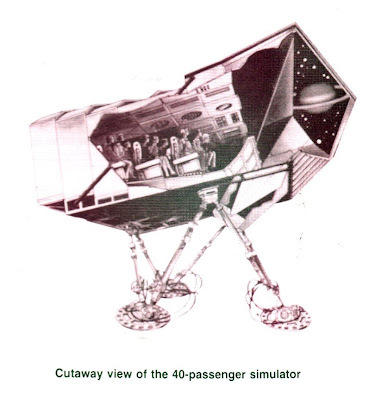 Tour of the Universe is a development by Interactive Entertainment Inc. which has identified 23 other cities around the world as potential space tour locations. They will be operated on a franchise basis and the second is to be opened in Japan this coming summer by the Seibu Co. Canadian Pacific will not necessarily be involved in the international locations as each franchise operator will obtain its own sponsors. A third tour has been proposed for Australia's Gold Coast. Meantime, Toronto is the scene of the action. Admission is $7 for adults, $4 for children and senior citizens. Interactive Entertainment is offering employees and Pionairs of CP Air, Hotels & Holidays a two for one introductory package good March 1 through April 30. The CP Air Vancouver Operations Centre acted as the main hub for the airline and was home to thousands of CP Air employees, a virtual city within a city. Costing $24 million dollars the Ops Centre was built in 1969 on the site of the previous headquarters of Canadian Pacific Airlines which was housed in the old Boeing Canada building at Vancouver International Airport on Sea Island. The entire complex covered 21 hectares (52 acres) and over 2,000 foundation pilings were installed on the soggy delta site to support the weight of the building and the aircraft undergoing maintenance. The third floor office space was equivalent to that found in an average 14 storey office building. 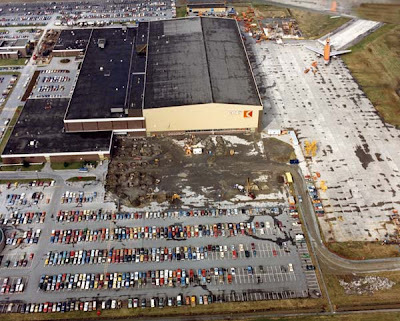 The Ops Centre's four hangar bays were capable of squeezing in five wide body aircraft and six Boeing 737s simultaneously if necessary. The hangar also featured the first concrete floor in Canada with a white metallic finish to give the floor a bright, light reflecting finish. 135 tons of pigmented iron compound were incorporated into the flooring. 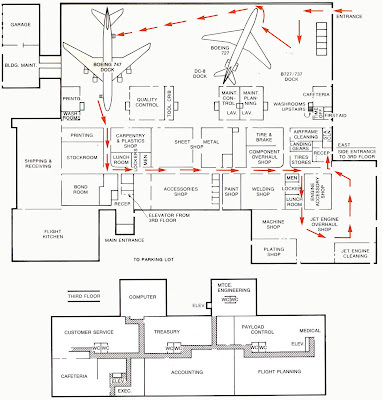 The schematic above (click to enlarge) shows the Ops Centre in 1974, the picture below (click to enlarge) of the Ops Centre is from an open house held in 1983, one of many the airline held over the years for employees and their families, media or its frequent flyers. 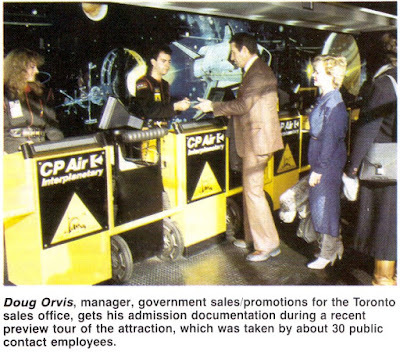 It appeared in a special edition of CP Air News in November 1983, see below for legend. A new engine test cell, capable of handling engines producing up to 100,000 pounds of thrust, has been erected on this construction site adjacent to the existing cell. Engines powering the current generation of wide body jets produce only 50,000 pounds of thrust, so the new cell will handle our requirements well into the future. As part of the Ops Centre fire protection system CP Air is required to maintain a back up water supply to that of the municipal service. There are two tanks, the small one holding 1,136,500 litres (250,000 gallons) and the larger one holding 2,727,600 litres (600,000 gallons). Houses the Ops Centre heating and air conditioning systems, emergency power generation, fire pumps, etc. The recently built hangar 4 can be seen to the right of the main hangars with the CP Air logo. Provides aircraft access from the Ops Centre to the airport terminal. Will also serve as access to the airport's future third runway, which will run parallel to Taxiway 'J'. Pilot training is done here in B747, DC-10 and B737 simulators. 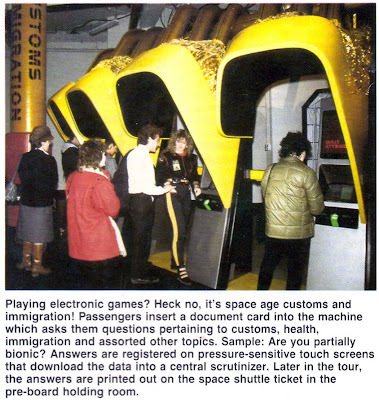 The B727 and DC-8 simulators were sold off after these aircraft were disposed of. CP Air also sells time in the simulator to other airlines and companies generating revenue. 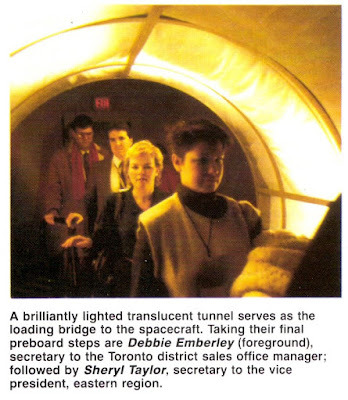 Executive offices would later be relocated to the Bentall IV tower on Dunsmuir St. in Vancouver in April of 1986. Named in honour of one of Canadian Pacific Airlines pioneer presidents, who died in 1965. Since 1975 when the Arthur Laing Bridge opened, this has been the main thoroughfare from Vancouver to the passenger terminal on Sea Island. The colorful birds sometimes seen on the highway shoulder when approaching the Ops Centre are ring necked pheasants, imported from China and released into B.C. as game birds in 1909. They've flourished in this hunter free environment. The males are noted for keeping harems of up to five of the grouse like hens. Soggy dike walled Sea Island is about a metre below the Fraser River in flood, and in 1860 before settlers arrived it was submerged more often than not. This area is reserved for terminal expansion and a 2,500 car parking lot is currently being prepared here. The Ops Centre parking lots hold 2,392 cars and 40 motorcycles. Repairs and calibrates the various controls, motors, pumps, actuators, etc. used in systems such as air conditioning, hydraulics, pneumatics, power generation, electrical, fuel, fire protection, braking and oxygen. Galley equipment such as coffee makers are also serviced here. Repairs, calibrated and overhauls the various indicating instruments and pressure sensors. Serviced are flight data recorders, cabin pressurization controllers, temperature indicators, fuel quantity, measuring systems, pneumatic instruments, and sensors, engine performance indicators, attitude and navigation indicators. The Gyro room with its filtered air controlled environment is used to service instruments which are especially sensitive to dust particles. These instruments include vertical gyros, directional gyros and standby attitude indicators. Repairs, overhauls and tests all communication and navigation equipment. This includes automatic direction finders, weather, radar, transponders, distance measuring equipment, VOR (VHF omni range), instrument landing systems and low range radio altimeters. Also, integrated flight systems, automatic pilots and passenger entertainment systems are serviced here. All modifications requiring sheet metal work and riveting are carried out here. This includes the repair of aircraft galleys, food tray carriers, bar trolleys and ovens. Other aircraft component parts repaired include ejector reversers, trim tabs, engine nose cowls, flaps, cabin seats, wing tips and numerous individual parts. All aircraft and engine parts requiring paint are processed. It is equipped with two waterfall type spray booths. The purpose of the water is to absorb over spray and with chemical additives reduce fumes to a minimum. There is also a drying room heated to 200 degrees to accelerate drying of certain component parts. The paint shop staff also strips and repaints complete aircraft during major checks using airless spraying equipment. 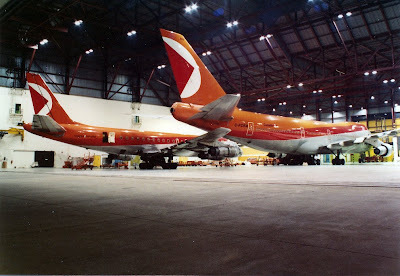 The large DC-8-63 jet requires 24 gallons of special paint while a Boeing 747 requires six times that amount. A wide variety of work is accomplished, including repair and refurbishment of engine, landing gear and aircraft components. Many items are welded or plated with chrome, nickel or silver to build up worn or corroded areas, prior to finish-machining or grinding. Metallic coatings are applied using the plasma spray technique, following which they are machined using conventional or diamond wheels in the machine shop. All aircraft landing gear is overhauled and repaired, including B747 wing, body and nose gears. A complete landing gear overhaul takes a minimum of three months as all bushings, fittings and bolts must be tested and installed to a close tolerance. Cockpit seats are repaired as well as flight control cables, flight controls, hydraulic fittings and plumbing lines, both steel and aluminum. Wheels are disassembled and checked and new tires installed. If the hubs warrant and overhaul they are cleaned, ultrasonically tested then reassembled with replacement of any worn parts. Brakes are examined, new linings installed, rotors changed and fitted when necessary and bench testing is carried out. Welds all aircraft parts such as engine cowls, engine parts and accessories. It also services all equipment used in the hangar for aircraft maintenance. Some 60 different types of welding rod are used on aircraft engines. In addition this shop has the capability of heat treating, plasma spray, wire frame spray and electron discharge machining. Handles the repair and overhaul of all the aircraft engines. Complete overhaul can be accomplished on the smaller B737 engines. Major assembly and disassembly is accomplished on the large B747 and DC-10 engines with some of the detailed work being sub contracted. Controls surfaces, cabin floors, structural angles and radomes are repaired. Window-crazing is removed and windows are restored to like new condition. Volcanic debris, mixing with water in the atmosphere produces sulphuric acid which causes the crazing you see on aircraft windows. This shop also manufactures many cabin interior components from plastic sheets, using the vacuum forming process. Woodworking and fiberglass fabrication is also done here. Responsible for testing, modification and repair of all types of aircraft, also unscheduled repairs, engine changes and backup support for Line Maintenance. This department also coordinates repairs to aircraft by all other shops and trades to maintain on time departures. The Non Destructive Testing (NDT) section of quality control carries out inspection of aircraft structures, engines and all components for hidden service induced defects (such as cracks, corrosion) utilizing non destructive methods. These may include radiography (using X-ray and radioisotopes), ultrasonic testing, eddy-current testing, fluorescent penetrant and magnetic particle inspection. Provides liaison between Operations and Maintenance, and schedules maintenance programs. 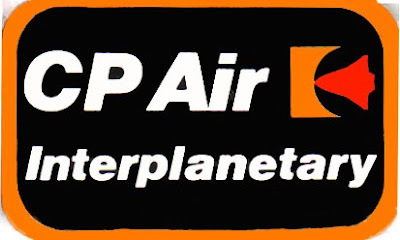 Maintains aircraft and engines to CP Air standards and policy. Coordinates purchase of parts and manpower with shops, line stations and material planning. Purchasing and Stores Depts. Ensures on time completion of maintenance work. In the upholstery shop all aircraft furnishings including seat covers, drapes, window curtains, cargo nets and carpets are manufactured and maintained. In the Survival Shop all life rafts, escape chutes, life jackets and safety equipment carried on aircraft are tested and repaired. Multi million dollar computers from IBM are used to process employees' pay records, provide figures for revenue accounting, billing to other airlines, passenger sales information, aircraft check times and rotable spares control data. The computer department was originally formed in 1960. Approximately 93,000 square feet on the second floor are devoted to the purchasing and stores department where parts worth millions in value are kept in order to maintain and service aircraft flying for CP Air. In addition, general stores for the upkeep of the administrative and operational sections are purchased by this department. 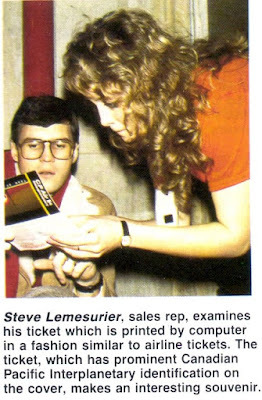 The department also includes a large printing and stationary area where travel brochures, schedules, menus, forms and publications allied with airline administration and printed for CP Air locations around the world. A large shipping and receiving area on the first floor is part of this department. Main operations include the cleaning and removing of grease and paint from parts directed to the overhaul area. Steam, detergents and hot degreasers are used rather than solvents for the cleaning. 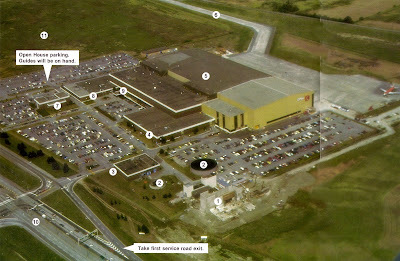 In 1974 the Flight Kitchen measured 32,000 square feet (later expanded) and was one of the largest kitchen areas in Western Canada. In this department more than 1,000,000 meals are prepared annually to supply gourmet food for CP Air flights. A large staff directed by 14 European chefs operates the flight kitchen on a 24 hours a day, seven days a week schedule. To supply the requirements of passengers flying out of Vancouver, the airline prepares annually 67,000 lbs of chicken, 25,000 lbs of turkey, 80,000 lbs of beef, 15,000 lbs of fresh salmon, 10,000 lbs of Alaska crab and lobster and 6,000 lbs dozen grade "A" large eggs. This is supplemented by 112,000 quarts of milk. This is for flights out of Vancouver only, at other flight provisioning points in Canada and abroad, food preparation is contracted out to commercial caterers. But these firms work to rigid standards maintained by CP Air. The freshly prepared food is placed into electric ovens in the aircraft galley just before take off and served piping hot during the flight. CP Hotels, which CP Air bought from Canadian Pacific Ltd. would later direct operations of the flight kitchen. All logos are copyright of their respective owners. Powered by Blogger.